Just two weeks after Apple confirmed iOS 7 adoption rates had reached 80 percent based on App Store usage during its 2014 Q1 earnings call, that number has now climbed higher to 82 percent based on an update on the company’s App Store Distribution page. 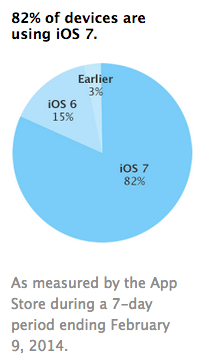 iOS 6 has dropped down from 17 percent two weeks ago to now sit at 15 percent of iOS devices based on App Store usage ending on February 9. This rate has been climbing steadily since the release of iOS 7 last September, where the new operating system saw an estimated 35 percent adoption rate in under 24 hours.